Now 33 years old, Brimstone, real name Seth Schere, has been bringing folks together in the name of hip-hop for years. His first bout of rallying, by his account, came at age ten. Having just seen the classic 1984 movie Beat Street, he persuaded elementary school friends to start a break-dancing crew. His most recent project resulted in the track “K+RS=One,” a collaboration earlier this year among twenty Miami MCs uniting to pay tribute to pioneer KRS-One. The track and its accompanying video have been getting a fair share of YouTube plays and MP3 exchanges. In a world of over-the-top egos and best-of-the-best rapper’s delight, to gather so many MCs to spit only four verses each, about someone other than themselves, was a near-religious miracle. A first meeting with Brim reveals an ?? ?ber-positive, ?? ?ber-enthusiastic personality that seems borderline Evangelical preacher mixed with kindergarten teacher. He begins and ends every greeting with bless, and never utters a curse word. His optimism translates into his music, released under the collective moniker Brimstone127 (127 being the street on which he grew up). 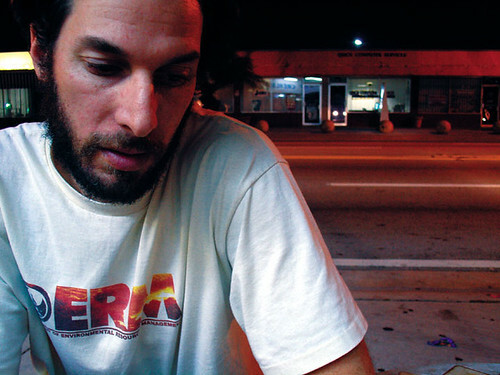 The 2004 LP, Metamorphoses, became a hit on college radio stations nationwide. Brim’s latest full-length offering, Elevator Music, released this past May, has upped the ante, with guest rhyming appearances by KRS-One, Busy Bee, and Mr. Long of Black Sheep, as well as production work by Dug Infinite. While most artists are comfortable staying behind the mike, Brim’s can-do attitude has taken him in front of countless classrooms and inner-city youth programs. He teaches youngsters real-life survival skills through hip-hop culture. Upon entering Killian High School, Brimstone gave up his spray can. He became friends with a New York transplant named Dionne, who, in Brim’s words, “dressed like those dudes in the music videos.” With Dionne’s baggy pants and wild color combinations, and Brim’s white-boy suburban appearance and a bit of street cred, the two outwardly made an odd couple. But his friend’s influence was major. The two quickly became inseparable and decided to start a hip-hop group they called Plan B. They recruited several other members to be part of the MC lineup, making Plan B one of the first hip-hop crews to come out of Miami’s southern suburbs. By 1991, a seventeen-year-old Brim dropped out of Killian High to take his music career full-time. Plan B released two full-length albums and produced more than 100 mixtapes, all of whose masters Brim proudly proclaims he still has, on cassette. And if that isn’t historical enough, Brim has been credited with launching Coconut Grove’s first hip-hop venue, the Zoo, in 1991. A venture Brim began with a cousin, the Zoo packed the house every Saturday night. Each week more than 200 of Miami’s biggest hip-hop lovers would go to hear local DJs like Coupe de Ville and DJ Kris. One night a freshly plucked thirteen-year-old got on the decks. His name was Aristh Delgado, and it was his first DJ gig in front of a live audience. Brimstone is famous for these stories. Deeply rooted in the local hip-hop community since, well, the beginning, he has no qualms about saying, “I was a part of that,” when describing Miami’s momentous hip-hop occasions. But with the amount of blood, sweat, and tears he has given, the Billboard success of other local acts has eluded him. He remains serene about it. “It’s out of my hands,” he says calmly. “I tried as hard as I can, and I have pursued those avenues of trying to make a hit record, but nothing ever comes up.” He pauses solemnly and then continues. link to where original article was published. You are experiencing the archives for July, 2007.